Place coconut in a large frying pan over medium high heat. Stir often until coconut is lightly browned and fragrant. Remove from heat and set aside. In large bowl, mix together the toasted coconut, flour, sugar, baking powder, baking soda and salt. In a separate bowl, beat the egg yolks with the milk, coconut extract, vanilla extract and melted butter. In a third bowl (glass or metal), beat the egg whites with an electric mixer until stiff peaks form. Add the egg yolk mixture to the dry ingredients and mix well. Fold the beaten egg whites into the combined mixture. 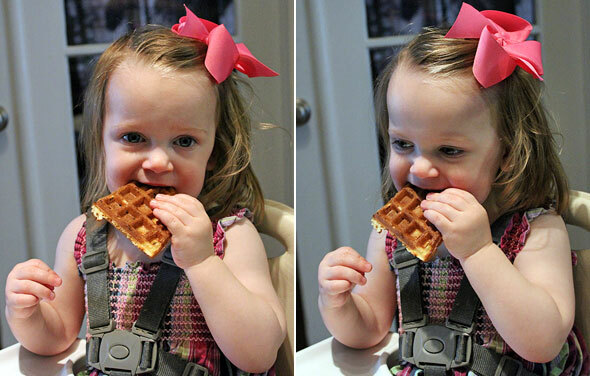 Bake waffles according to your waffle maker's instructions using approximately 1/2 cup of batter per waffle (this may vary depending on the size of your waffle maker). Hi Mr Breakfast - I saw that the Coconut Waffles recipe on your site was getting some pretty bad reviews, so I wanted to share my winning recipe with you. Toasting the coconut and adding a little coconut extract really adds flavor and beating the egg whites separately makes them fluffy. I hope everybody likes it as much as I do. HOT TIP! When you toast your coconut, add an extra 1/3 of a cup that you can reserve as a garnish. 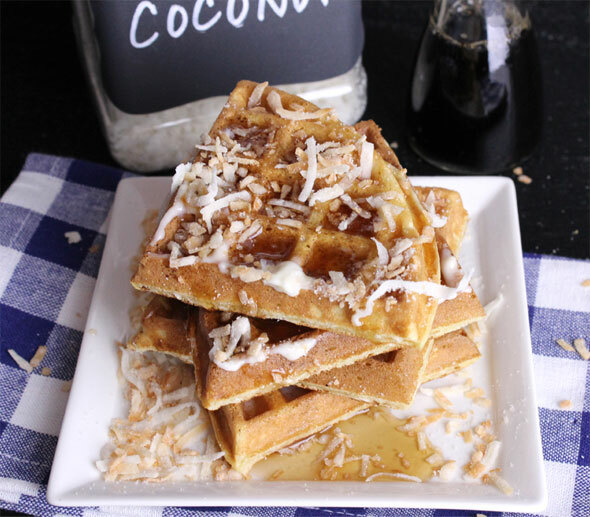 The extra blast of coconut takes these waffles to an even higher level of excellence. 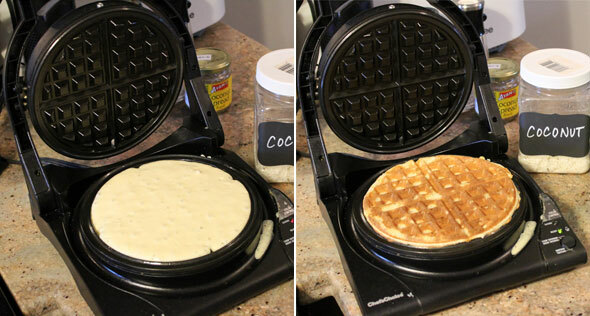 For my recipe test, I used a Chef's Choice M840B WafflePro Waffle Maker. The amount of batter produced made 8 6-inch diameter waffles that were 1/2-inch thick. 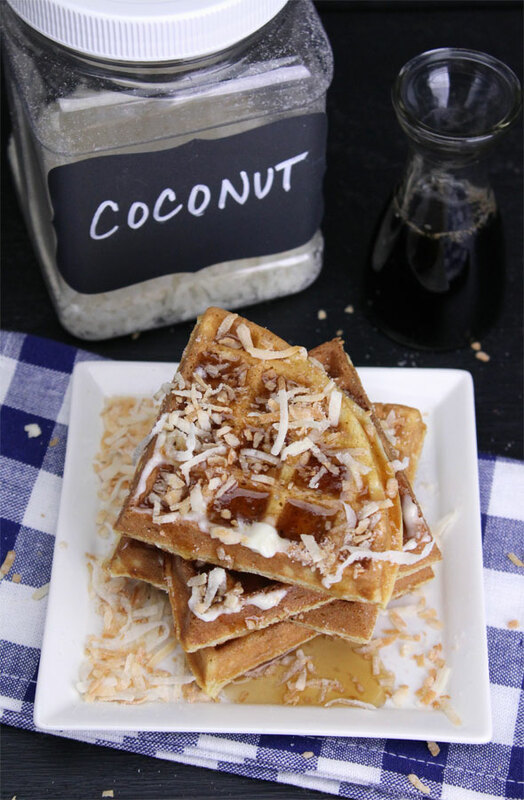 Crisp and light waffles with the perfect amount of coconut flavor. Garnish with additional toasted coconut for even more flavor. Mr Breakfast would like to thank breakfastbun for this recipe. Recipe number 2556. Submitted 5/22/2009.